URBANA, Ill. – This time last year, the threat of a major pumpkin shortfall was in the news. Sources were predicting that the 50 percent yield losses—due to early rains, cooler-than-normal weather, and fast-spreading disease—would mean fewer pumpkin pies at Thanksgiving. But thanks to manufacturer decisions not to reserve stock for after the holiday, the doom and gloom scenario was largely not borne out. Still, the lead-up to Thanksgiving was a tense time for the pumpkin industry. This year, according to University of Illinois plant pathologist Mohammad Babadoost, the pumpkin outlook is much improved. A scare came in mid-August, when downy mildew reared its head in some fields. This fast-spreading fungus was one of the pathogens that wreaked havoc on the pumpkin crop in 2015. Fortunately, its occurrence has been confined to a small area in Tazewell County, Illinois, and it has not been a significant problem elsewhere. Other isolated diseases have been detected. For example, a bacterial disease has been on the rise in jack-o’-lantern pumpkins across the Midwest and worldwide for the past seven to eight years. “This bacterial disease affects leaves and fruit. When the disease gets onto pumpkins, it produces tiny spots, or lesions. Growers can’t see them unless they are very carefully examining the fruit. Those tiny lesions are then colonized by opportunistic bacteria and fungi, and then the fruit just collapses. We are working very hard to find good management, but it takes time,” Babadoost explains. A few farms in Illinois and Indiana have observed fruit rot after seemingly healthy pumpkins were placed into bins for sale. Babadoost investigated and discovered that the problem was worker sanitation. “The workers cut and collect the fruit and put it in the bin, which goes to the warehouse and finally to the stores,” Babadoost says. “A few pumpkins in the field are affected by phytophthora—a fungal pathogen—and are rotting on the soil side. Workers pick them up and realize the pumpkins are decaying. They put the infected pumpkins down, but their hands are now contaminated. When they pick up healthy pumpkins and put them in the bin, their contaminated hands transfer the pathogens to the uninfected pumpkins. After a few days, the pumpkins start rotting from the top or sides, wherever the worker touched them. “Growers should be very careful. 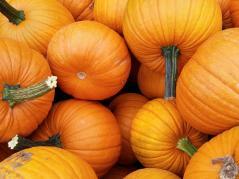 If workers touch infected pumpkins, they have to decontaminate their hands. Use alcohol or wash before touching uninfected pumpkins. That was a new observation this year. I saw spectacular rotting in the bin,” Babadoost notes. Some farmers have complained of rodent damage in the field this year. Jack-o’-lantern carvers can relate, recognizing those unwelcome chew marks on Halloween pumpkins. Babadoost says the squirrels and mice are after the seeds inside, even though most are scooped out before carving. If pumpkins are displayed on porches, it is not uncommon for them to rot after only a few weeks. But if they are kept dry, Babadoost says, most pumpkins can last a very long time. A large uncarved white pumpkin has decorated his lab space for over 14 months, with no sign of fruit rot.